The Luck brothers were born in a small town, and though the first few years of their life remained uneventful, things began to change as soon as they started teething and Riley bit the bars off of his crib. 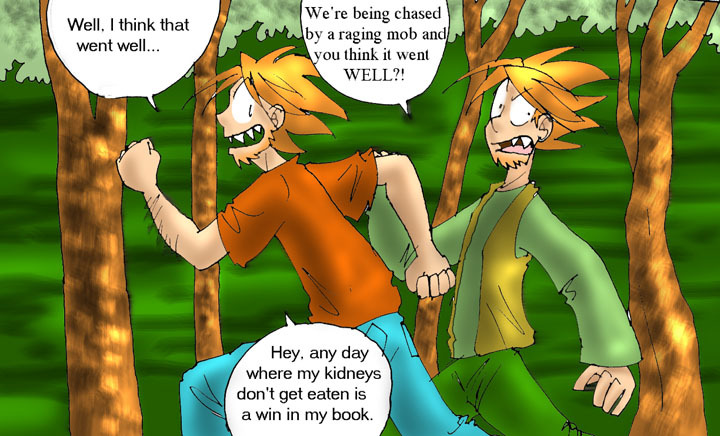 The Luck brothers are half human, half were-shark. Their father dissapeared before they were ever born, but their mother did the best she could to raise them, which included chasing off any reporters with her frying pan. She wanted her children to have a peaceful life, but with their unusual powers becoming more and more evident, the brothers decided to leave home. They did so when they were 18, they are 24 now and have not seen their home since. Being only half were-shark, the brothers cannot transform. Well, they probably COULD, but there would be no gaurantee that they wouldn't lose their lungs and fail to grow gills, or something equally painful. Their teeth are ginsu sharp, and replace themselves quickly if they are ever knocked out. Their teeth are the only noticable shark trait about them, and simply grinning at a passing waitress has gotten them chased out of many a town. In addition to their teeth, they have the ability to hold their breath for up to ten minutes, have hightened senses, and unnatural but limited strength. If they both worked together, they could lift a small car over their heads, but no buses. If the brothers become very scared or angry, they may start to go "sharky." It's a state in which their animalistic side takes over their minds and their only thoughts are to either get out of danger, or destroy whatever it is that is making them angry. It can take a while for the sharky to wear off, and in that period of time their motives will be entirely animal based. They will probably search for food, shelter, or each other. Both brothers can use swords, and can fight weaponless if need be. Riley Luck is the younger of the brothers, though you would never guess it by looking at him. He is bold, brash, and a bit of a show off. Riley is definatley the more animalistic of the brothers and goes sharky more often then Tuff. He acts upon pure gut instinct, and rarely thinks anything all the way through, and will always choose instant gratification. Riley is also a proffesional tail chaser, he spends most of his time flirting with any attractive female who doesn't run away fast enough. Inside he is really quite the gentleman, but when he first meets a girl he has a tendency to come on too strong and brash. To top it off, he's a persistant little bugger, and if his target seems interested in the slightest he'll keep following her around until she karate chops him to the throat. Despite his shallow exterior, Riley really is a good guy though. He would never force himself upon a woman, and despises men who mistreat the lovely ladies in ANY way. He trained himself in the use of his sword, the Jawbreaker. It's very heavy (only he could lift it) and when he swings it, it will pull him off his feet if he's not careful. Though the Jawbreaker is unwieldy, if it hits you, you won't have a second opportunity to dodge it. When he's not flirting, he's usually playing his banjo, watching shark movies (JAWS is his favorite) or doing odd jobs for money. Tuff Luck is the older brother, and is rarely noticed next to the loud antics of Riley. His is quiet, shy, and polite. He only goes sharky in the most extreme of situations. Though he is not as strong as his brother, and his sense of smell is not very powerful, he is the only brother to have the animal sixth sense. It's the sense that made thousands of animals desert Hiroshima DAYS before the bomb was dropped on it. With it, Tuff can be warned of incoming dangers, though he can never tell what exactly it will be. He is slighly paranoid, and he has developed a razor wit to counter his brother's caveman humor. He is also a bit of a germophobic, and hates sticky stuff. Tuff shares the same adoration for women that his brother does, but is far too shy to act upon it. He has no problem talking to women, but if the conversation starts to lead in a more romantic direction he gets flustered. Tuff considers himself Riley's protector, and when his younger brother gets into trouble, it is usually Tuff who gets him out of it. He took proffesional classes, and can wield his two swords, the twin swordfish. While his brother is clumsy but powerful, Tuff is incredibley dextrous and is a surgeon with his swords. He may not be very strong, but he's light on his feet and can dodge in between his brother's swinging to get at the opponant. Once Tuff gets into close range, there is no way to stop him. When he's not saving his brother, he's usually playing his violin, reading mystery novels, or trying to keep their apartment from becoming a toxic waste dump. The brothers have traveled to VOID for two reasons. It has one of the most diverse populations in the world, and the brothers decided that if they could fit in anyplace, it would be here. Also, because of the were-beast population, they hope that they may be able to find their father somehwhere in this mess, if he isn't dead. Note: The comic pages used in the intro comic are from a larger comic I do in my spare time, which is why the situation might not make sense.